Sunday, September 20th, the primate (Pet) will be spending all day designing retro-style animal caricaturez. If yoo wants your pet, oar if yoo wants yourself if yoo iz an animal, made into a retro cartoon, comment with a link to a picture and your fafurrite colorz. If yoo is on Twitter, sends me a twitpic with the hashtag #retrotoon and yoo fafurrite colors foar backgrounds. Yoo can sends it any time in the next 7 days! In return, the hooman gets to use your pets az inspirashun foar art and yoo gets a 1000×1000 pixel retro cartoon to makes into avatars. See more progress on: Come up with 400 designs for Etsy by Mid October. My primate iz taking part in a Banned Book Challenge sponsored by Bibliobrat during the month uv September, leading up to the ALA’s official Banned Book Week. Also, she just joined Swaptree and has started trading books there, so wat she ends up reading depends on a somewhat random trading system. Shud be interesting. Iz hard for hur to find challenged books to read on the frequently challenged lists cuz she reads so many uv them befoar, so she trading foar some classics she missed and sum noo ones that may only have been challenged in small areas. A challenged book is one that someone has tried to have removed frum a school, classroom, oar library, mostly. There iz many reasons people want them removed that uzually reflekt the opinions uv a small group uv people in a certain time period. For instance, The Adventures of Huckleberry Finn iz uzually challenged these days for ironic use of the “N” word (sometimes the sarcasm iz lost on people…. ), but when it furst got into schoolz it was challenged foar portraying an inappropriate friendship between a white child and a runaway slave. All challenging books seems to do iz make them moar popular. There iz a LOT uv books mai primate wouldn’t have read if she didn’t need to find out wai she wasn’t supposed to read them! Prolly sum uv hur reviews won’t be suitable foar kids, so she’s keeping them at 43 Things. If yoo interested in reading them, yoo can goes there. Make sure yoo iz using wild Chicken uv the Sea Pink Salmonz, cuz iz certified sustainable bai Marine Stewardship Council and also, hao often yoo gets chickawn and fishies and mermaids at the same time otherwise? 1. Mix together first 4 ingredients. Doos it until the bread thingies start to gets mushy, then let it sit there foar awile. 2. Lick out salmon package. Iz very important yoo not skip this step! 3. Hiss at yoor sistur wen she tries to steal yoor salmon package cuz she haz hur own salmon package! 4. Put maple syrups onto the buns and spred around. Iz ok if it sinks in, iz supposed to doos that! 6. Make 8 patties, cuz thats hao manee buns yoo haz. Lick yoor paws between making patties if no hoomanz iz watching. Cook dem in nonstick spray on both sides. 7. Hoomanz has to eet green stuffs. Put on a bun wif lettuce and send yoor hoomanz outside to eet dem. 8. Lick out the bowl wile they gone to cleens it. Primate sez yoo can replace the maple syrup wif honey butter oar blue cheese dressing or Thousand Island dressing oar Ranch dressing. See more progress on: Make up 43 recipes. 100 Fans Lucky Maneki Neko Giveaway! On Facebook Pages (not profiles), you need 100 fans before you can get a username. Thanks to the nice people on Etsy, I did it! A wealthy feudal lord was taking shelter under a tree near Gotoku-ji temple during a thunderstorm. The lord saw the temple priest’s cat beckoning to him and followed; a moment later the tree was struck by lightning. The wealthy man became friends with the poor priest and the temple became prosperous. When the cat died, supposedly the first Maneki Neko was made in his honor. The Maneki Neko comes in a wide variety of traditional colors and styles, each representing a different lucky subject. Calicos are for general luck, Red and Pink for love and romance, Black for protection from evil, Gold for prosperity and White for a positive future. The Beckoning Cat, also known as Welcoming Cat, Lucky Cat, Money cat or Fortune Cat, is most often depicted as a Japanese Bobtail cat, a cat with a tail somewhat like a rabbit’s. They also come with long tails, right or left paws raised, both paws raised, and with the paw facing backwards for Western audiences. 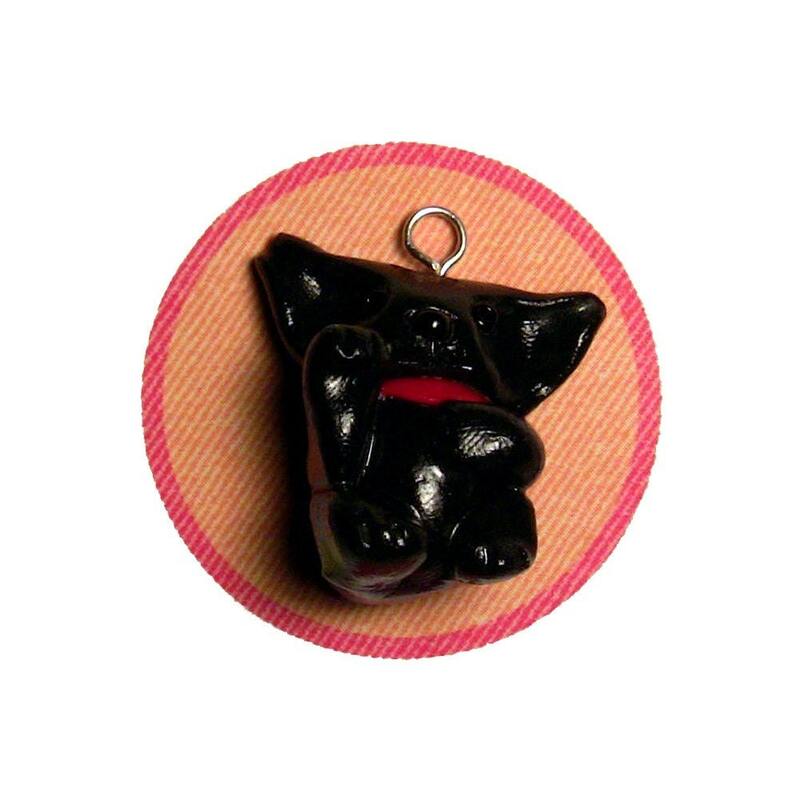 The pendant will be about the size of a quarter, hand-painted to match your request, with a collar in your favorite color. I triple-glaze so they have the feel of a china animal, but they are made of durable polymer clay. Will be shipped free anywhere in the world in a velour gift bag, and arrives on an 18-inch black PVC cord with sterling clasp, a 24-inch “dog tag” ball chain, or an ID lanyard (your choice). This post is going up in four places. You can enter at all four and quadruple your chances of winning. On Facebook: Post a link to a picture of your favorite animal as a comment on this note and explain your choice. On the Animini City Blog: or on Loki’s Blog, Log in to the comments with your facebook, twitter, google or open ID account and post a picture of your favorite animal directly in the blog comments and explain your choice. Be sure to tell me who you are on Facebook if you don’t use your facebook account. On 43 Things: Comment on this entry, explain your choice, and upload a picture. Be sure to tell me who you are on Facebook if you don’t use your facebook account. You must be a fan of Orange Cat Blues’ Animini City on Facebook. Of course, I finally hit 100 fans just before I visit my parents for over a week, and I won’t have any clay with me because I can’t bring it on the plane! So, on the Saturday after next, I will hold a random drawing from all qualified entrants at Facebook, Animini City and 43 Things, and announce the winner Sunday. See more progress on: Give stuff away for fun. Dis wuz mai modeling seshun last weekend. I shows yoo hao we choozes the pikture foar the Animini Me Cat Collar. Furst, yoo need to know I gets paid in Fancy Feast inna can, the kind wif the gravy. I takes 10% up front. That wai in pikture 1 I yoo sees me negotiating wif the photografer. It takes sum time to sets up the shoot, and sumtimes photografer takes stoopid shots like 2. I stretching in 3 and 4. Wen I want sumthing, I stands up like a hooman. Here I wants the rest uv the Fancy Feast, but in order to gets it, I need to be moar serious. In pikture 5, photografer going foar the cute looking up look, but can’t sees the collar innit, and foar sum rezon they trying to show peoples the collar and not me. Picture 6 I giving mai “bored model look”. Unfortunately, photographer tells me they not trying to convey boredom. So I whips out mai most intense predatory stare. I calls it “Le tigre”. Photografer likes it az a picture and might turn it into a painting, but not to represent the collar. Also, they need space foar wurds and mai tail iz inna way. She tells me to be “perky”. Rite aftur I rolls mai eyes, she took shot 8. As yoo can see, dis the one we uzing, and I gets to haz the whole can uv Fancy Feast. All iz well! I watched alla dese moovies in the last few dayz. I watched Mouse Hunt cuz it haz Walken innit. Also it haz mouses! I unnerstand that it wuz really a live-action cartoon and yoo can see which bits iz taken rite outta Tom and Jerry and stuffs, but aftur awile I gots bored wen Walken wasn’t onna screen. And wat with dat Catzilla in dat horrible sheltur? I’d be like Catzilla, too, if I came frum a sheltur like dat! And efurry time I left to gets a snack I cuda sworn I hears a meerkat talking. Anyhao, I didn’t like it enuff to recommend it unless yoo is trying to see alla Walken’s movies, but it nowhere near az annoying az Pennies from Heaven. I also watched Monkeybone to learn about hooman nightmares and because it haz Death az a character. Iz also the reezon I watched Mr. Rice’s Secret. Monkeybone wuz OK. The place ware alla the coma people go was definnatly wurth watching even if the storee duzn’t suit yoo just foar the artwork and character designs. There were sum really highbrow gags that came outta nowhere that made me wunder if it written bai moar than one purrson oar bai one purrson’s right and left hands. Story pretty predictable but the art directshun wuzn’t. The Kitty lady wearing alla the Egyptian designs wuz a good touch, and Whoopi Goldberg as Death wuz a genius casting job! BTW, even tho it has a cartoon monkey, iz not fur kids. There a doggy innit hoo playz a crucial role in comfirming the hooman’z identitee. I saw sum bad ratings foar Mr. Rice’s Secret, but it seemed like most the gripes were that there wasn’t enuff David Bowie innit and the mysterious treasure map didn’t take the kid to Narnia and the kids behaved like kids insted uv the way parents want kids to behave, so I watched it, and I liked it. Yeah, it haz sum of the feel uv an after-school special cuz there’s a rivalry between kids with cancer and there’s a wise older Obi Wan type uv neighbor, etc. But the fantasy parts were subtle and the kids’ dialogue rang true. Sum parents might be offended bai some language because they iz expecting moar of an aftur-school special, but kids are gonna hear far wurse frum their friends. Death appears az the local undertaker. He not a bad guy, really. Storee haz a good lesson, but I don’t remembur if dere’s anee aminalz innit besides inna birdhouse. Anyhao, I think Mr. Rice’s Secret wuz the best uv those three. See more progress on: Lern moar abouts hoomanz bai watching dere moovies. Got in my first Etsy Treasury today! Treasuries are collections of twelve items chosen by Etsy members. I guess the items on the main page are chosen from the treasury items, but I’m not sure. Google says most of my hits come from Twitter, so I’ve been ignoring the onsite Etsy options. I’m comfortable on Twitter. I like talking to people. I also haven’t really paid much attention to it because since what I sell is, in my opinion, ice cream, and the items on the main page are usually chocolate souffles. I looked into the treasury system once and backed out. The number of treasuries are limited and there’s some kind of mad land rush I’m not comfortable with, being a newbie. I got a note today from MasqueFaire , who has a marvelous Tiger Mask here , telling me she put me in this cute Bizarre Bazaar about cats . So my Deluxe Hairy Potter is in with an awesome two-headed kitten and a hilarious Zombie Kitteh plate , among other things. I’m quite pleased to wake up to this, because yesterday was a No Good, Very Bad Day. See more progress on: Remember to publicize appearances of my artwork in a timely fashion. Uzed to be Toozday wus our Procrastinashun day, but we changed it to Momday cuz Toozday is Dadprimate's day off and sumtimes they goes on dates. Dere two things we been meaning to do: gets a noo video card and writes a blog about othur blogs. Although we gets sum monies frum Etsy, we still not getting noo video card. Primate iz on Funemployment, az yoo prolly know, but she not getting unemployment monies cuz she supposed to get a severance package at the beginning uv last month, but the purrson on the envelope hur severance paperwurk was addressed to got lade off so the company lost it and she had to send it again. So we had to uze the Etsy monies foar kibbles and moar supplies inna meantime. Iz OK, though! Primates has the garden and I has kibbles, so all iz well! Dere is people and aminalz MUCH moar worse off than me. Iz wai I still giving $5 away foar efurrything in the charity sekshun. Long storee short, I still not making noo videos until severance package comes. I getting antsy, too, cuz wen I makes videos I get to play wif the peacock feathur and eet Fancy Feast off a giant spoon and tell jokes. But if yoo wants old videos, they free heer, except foar mai Super Bowl Video cuz CBS ownz it. Inna meantime, Daisy the Curly Cat iz trying out Crazy Talk on hur blog! She haz a video riddle up there today. Yoo shud go tell hur eithur on hur blog oar on Facebook to get the full version cuz since Laz broke mai good video card fan wif hur furs, hoomanz starting to think we aminalz onlee talk in LOLcat capshuns! I has sum blog mentions! Mai frend Lian Xin, the Painting Chihuahua did a blog post a long time ago wen I sends hur a painting Chihuahua Animini. She even waring it and calling it a Mini Me! :D Yoo can sees the pikture on hur blog. Todd the Office Cat not onlee mentioned his Animini-Me in his blog, he puts it in da noozpaper ware he writes articles efurry Thursday! WOW! Yoo can fans hiz noospaper on Facebook, too. Since lots uv Tweeters hoo iz aminalz iz also in books, we decided to has a Pets on Twitter book exchange . We traded books wif Cheshire Kitten . I gave Cheshire and Robin a copy uv mai book, and in return I gots a copy uv Please Send Money, a tiny photo book that haz a story bai Cheshire Kitten and feechurez picturez uv his familee. Iz a storee about hao the kittehs comes up wif an idea to earn monies fur kibbles in the recession. Iz good fur kids and reminds me a lot uv the classic book Two Kittens by Marjory Schwalje, which iz ware I gets the idea to wear clothes. Iz very clever and funny and the color photos do a great job illustrating ,so I gives it 4 paws up! Yoo can gets it frum Cheshire Kitten on Twitter oar read more bai Cheshire at the Cheshire Loves Karma Blog . They sells them on Etsy foar yoo. "It's the same old story. They couldn't care less about people and they love animals," lawyer Sam Shamansky said. That statement right there? That iz the center of the onion. It prooves there iz two kinds uv hoomans. There iz hoomans hoo understand wai companion animalz matter, and hoomans hoo will nevur view pets as anything but fuzzy burglar alarms and mousetraps. Some hoomans iz persons, some iz replicants. In the science of transhumanism, "personhood" iz a term uzed to decide, theoretically, if a lifeform iz a person. They uze philosophical questions to find out if a synthetic lifeform, or an intelligent computer or a genetically-altered aminal iz a person. You could do it like the Voight-Kampff interviews they do to find replicants in Blade Runner/ Do Androids Dream of Electric Sheep, but iz safe to say, in mai opinion, that companion aminalz iz the bestest barometer uv personhood. Compassion: Wile there are lots uv storees uv interspecies compassion like apes attempting to rescue birdies and dogz nursing kittens, no aminal iz able to express interspecies compassion az well as hoomans. Most hoomanz, anyway. Hoomanz get a star for personhood if they feels compassion for an aminal outside their own species. If a hooman iz willing to inconvenience himself to keep an aminal from starving, oar beings hurted, oar dying fur no reason, he haz compassions. If he shoots his dogs to go on a cruise, he doesn't. Iz simple. This firefighter may be human, but he iz not a person, cuz he lacks star uv compassion. Iz unlikely he will risk hiz life to rescue a companion aminal from a fire. Character: A man's character iz defined bai wat he wud do if he knew no one wud find out. David Santuomo gots found out, then he wuz remorseful. If he truly remorseful, he would have turned himself in. Iz wat hoomanz wif character do when they make a mistake, specially a big one. The ability to admit a mistake or a fit uv mental-breakdown rage, oar watevar, befoar othur peoples turn you in iz a sign there iz some good character left in a hooman. Being sorry iz a sign uv character, being sorry you got caught and punished iz not. Iz lack uv personhood. Responsibility: One uv the main reezons hooman children gets pets iz "to teach them responsibility". Iz prolly a good idea to get a foster pet frum a sheltur first to make sure kids will be responsible, but that's anothur storee. Companion aminals become permanent kittens and puppies when they iz adopted. Contrary to popular beleef, instinct to play iz not the same az instinct to survive. Hooman children like putting bright, shiny objects in dere mouths, but if you let one loose in an apple orchard wifout a grownup hooman to shows them wat iz food, they prolly won't survive. Iz same wif aminals when they has no mother to teach them the furst year. Iz wai kittens make bad mousetraps. They needs mommy to teach them wat to eat, or has to figure out bai accident. Iz also wai dogs need behavior and potty training. Children hoo take on the responsibility uv becoming noo parents uv pets learn to be responsible when they iz grown up. Children hoo treat aminals like living burglar alarms and mousetraps don't learn responsibility. This guy, he has filed fur backruptcy twice AND had home foreclosure, then went on a cruise but "couldn't afford" boarding? This not a guy with bad luck in the economy like some people forced into forclosure. He irresponsible and incapable uv seeing the consequences uv his actions. He lacks personhood. Iz right there in his history. Empathy: These dogs also belonged to hiz kids and ex wife. Two neighbors offered to watch dem. The Humane Society would board them. But he hung them from a pipe and shot them anyway, texted about it, and bragged about it to coworkers. So not only did dogs die horribly, his kids and exwife and helpful neighbors and horrified coworkers now all feel bad, too. This showz willful disregard and inability to "feel another's pain". Iz classic lack uv personhood. Love: I dunno if you male primates reeding dis know dis, but iz an old trick uv female primates to find out if a hooman man iz worth considering marrying. Iz not a good job, or a good car, or hao he treats hiz mom. Cud be he has a life's work outside his job, or he likes wurking on cars, or he has a bad mom. Hao a man treats companion animalz iz hao he treats women. If he haz conversations with them, and plays with them, and shows them off, and shares his couch, and gives them treats, and they shows enthusiasm when they see each other, he a good man. If he ignores dem, hits them, forgets to buy food, locks them inna room when company comes, or hypothetically speaking, shoots them so he can go onna cruise, he not a good guy fur a long term relationship. Lack uv love means lack uv personhood. In mai purrfessional opinion, David Santuomo receives no stars fur personhood. He a replicant, definately. I kicks mai primate out! Az yoo know, mai primate iz on funemployment, and nao they has losted one car so even if she gets a job, she cannot guarantee she can gets there, and she wud be wurking just to pay fur a car to get to wurk. Wud be stoopid. We lives in the country-- there iz no subway ware there iz corn, I guess, but there lots uv bunny holes. She not getting government unemployment monies cuz she haz a severance package and an online bizness. As @neotigress pointed out, it looks like the universe wants hur to stay home and make art, which she shuda been doing 15 yearz ago, if you ask me. But I don't wants hur messing up mai blog nao that she's home all day making Animinis, so I makes hur get hur own blog. Iz ovur at Animini City. Prolly sumtimes I guest post there cuz someone has to keep an eye on hur. She planz on having the Animini storees take place in Animini City (like the Verminator storee), maybe cartoons, and right nao she haz a poll to find out wat to name the street the Fantasy Color Animinis iz having their tattoo party on. Also, she looking to trade copies of books with other aminals like me on Twitter hoo iz in books. Check out the "Pets on Twitter Book Exchange" if you iz interested in trading! If she evur gets 50 followerz at hur blog, she starting to have contests there foar free Animinis and Cat Clothes. Prolly I will post that heer, too. Caturday Poll: Which aminalz wud you like to meets moar uv? Which bug superpower wud you most like to has? "Float like Dragonflies" won bai a landlide, followed bai half az manee votes foar "Strength uv Army Ants". "Glow like Lightning bugs" and "Climb like spiderz" tied next and no one voted foar "Breathe Fire like a Bombadier Beetle", which iz not that surprizing cuz they akshully make fires outta their butts, which iz kinda gross. Anyhao, there iz a noo Caturday Poll up on the right! Vote away!